Peter’s Inn – eating my way through Charm City! The fancy red door of Peter’s Inn drew me right in. This place is TINY; a row home turned into a restaurant with a big wooden bar and a handful of tables. This is definitely a locals spot and folks pile in. The staff is not showy. If anything they are kind of relaxed and laid back. I can’t say this is a whole in the wall; the moment you open that door there is a ton of hustle and bustle. Even after 20 years, they don’t take reservations; its first come, first seated. Or, you can send a friend over ahead of time to enjoy a few Manhattans and put your group’s name on the list. Peter’s Inn is not as fancy as the white table clothes would have you to believe. The silverware and napkins are handed out in those paper popcorn bags. It’s obvious that the menu changes regularly, because it is hand written and then photocopied. No printed menu’s here. It actually confused me a little; I found it hard to distinguish between descriptions of items vs entirely different items. And there isn’t any separation between small plates or large entrées – well except the price :-). We shared a few apps to start. Our service was a little rocky. It took a while to order drinks and food and they were consistently out of the few wines we wanted. 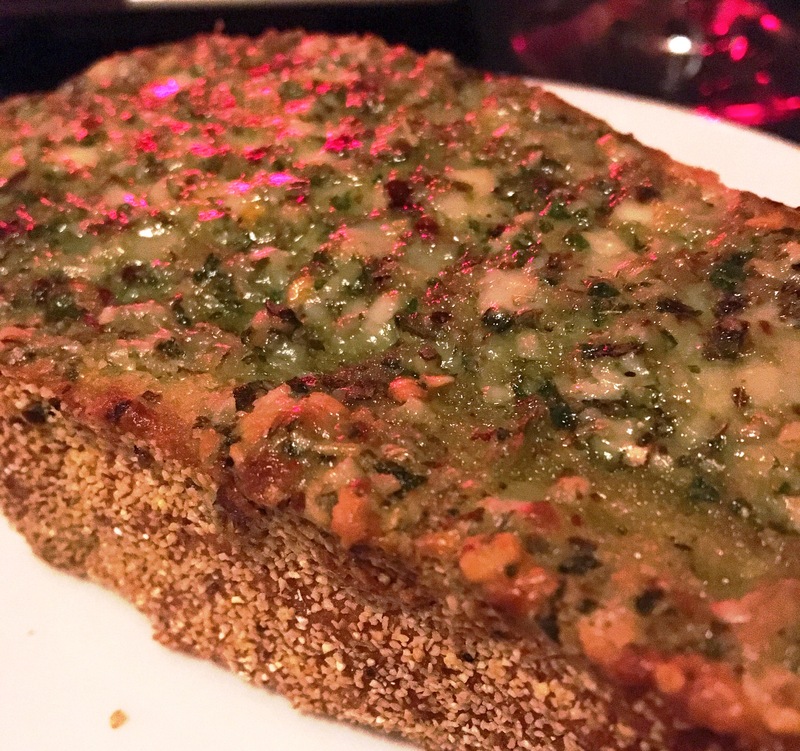 Everyone got a slice of garlic bread – worth it – huge, thick slices of bread slathered in garlic and herbs. It was definitely rich: salty, savory, buttery, and exactly what we all needed. Turns out they give you a bite of this if you check in on Facebook! Winner. Next, was a rillette and some toast points. As if the garlic bread wasn’t enough – why not add a bowl of seasoned animal fat to the table. The creamy, meaty spread coated your mouth and definitely set up my palate for more. I would have liked to see this paired with a little more than just bread – maybe some cornichons or pickled shallots. Something to cut the fat and offer you a reason for a second bite. This was tasty, but seriously a bite or two will do it. Make sure you have a table full of folks if you plan on finishing this. The burrata was definitely the star of the app order. 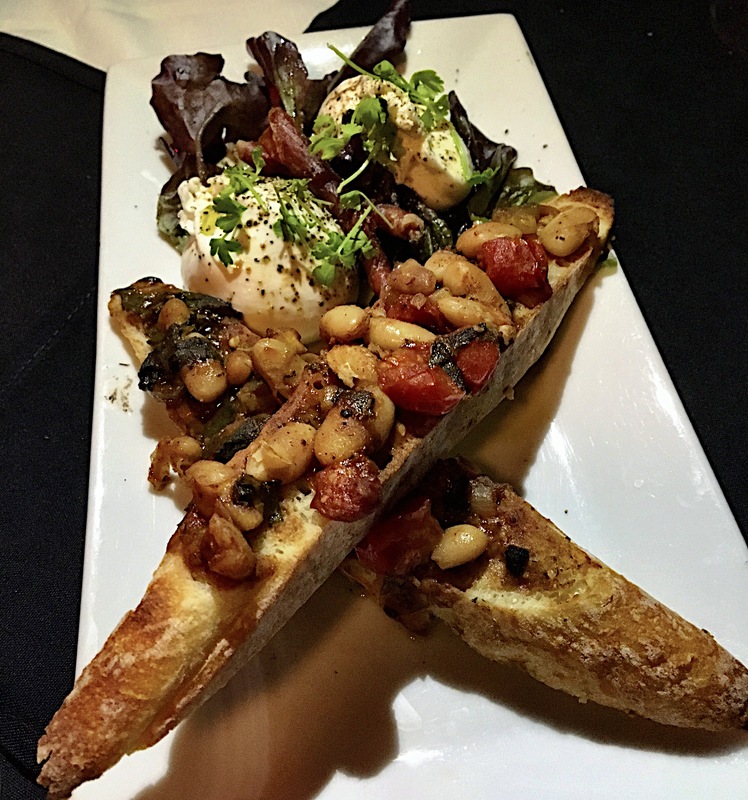 There were some spiced beans and tomatoes on toast with the creamy cheese. Finally, a balanced dish to come out of the kitchen. 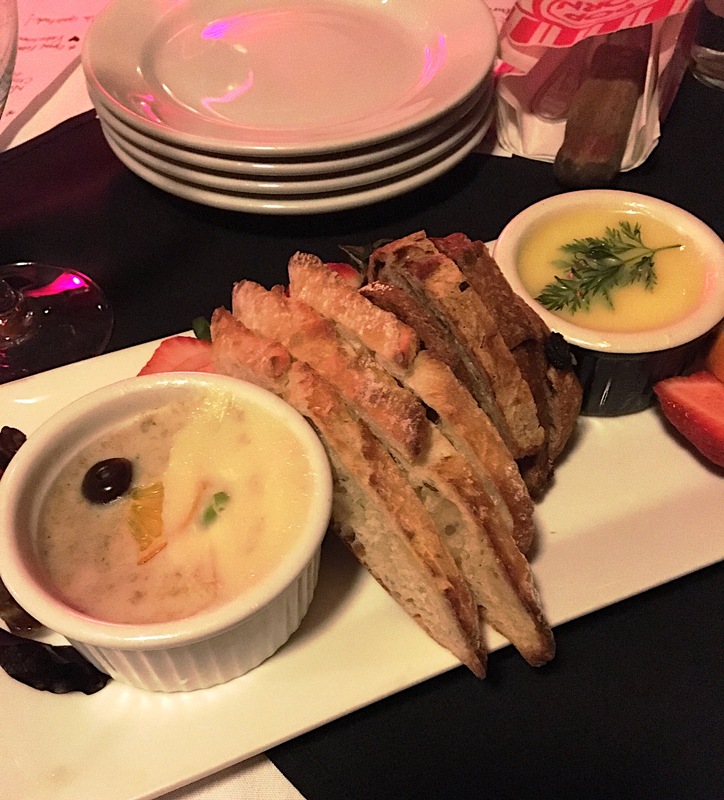 The cheese was velvety and the crunchy bread offered a nice texture complement. The spice of the toasts – maybe Harissa or cumin – made for a taste bud pick me up. We had some salads that were not memorable or even worth discussing – so I’ll stop at that. The entrées were gorgeous! 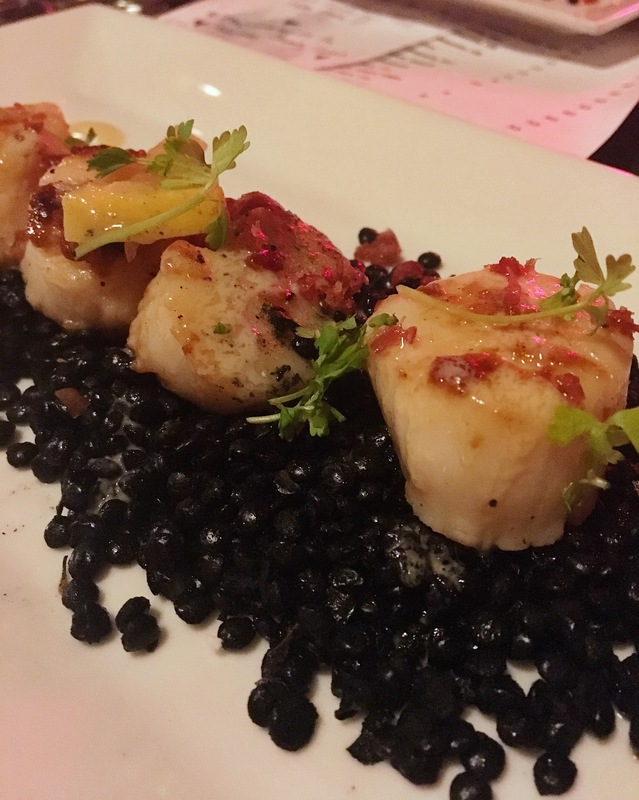 I had the scallops over black lentils. The black lentils seem to be hitting the food scene hard – maybe because they add intrigue to the plate with that luxurious and glistening look of caviar. I like a little sear on my scallops – there is something about that brown scorchy-ness that offers the slightest texture component and a little extra caramelization for something sweet. But, I’ll take a properly cooked scallop without a sear over an overcooked rubbery one every day. I liked the lentils, but more for the look than the taste. I was hoping there would be something to bring the flavors all together. 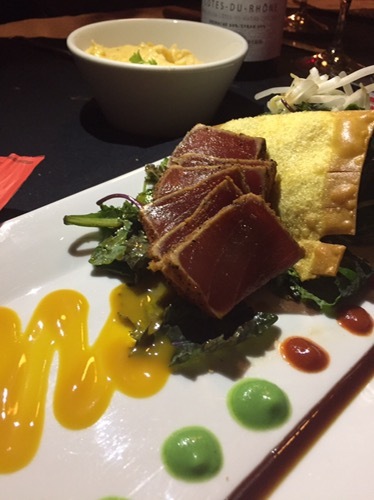 I definitely had some order envy over this tuna dish. Seared rare tuna over a bed of salad greens. It disappeared before I had a bite, but there were no complaints. And look how pretty. I would probably go for that next time.